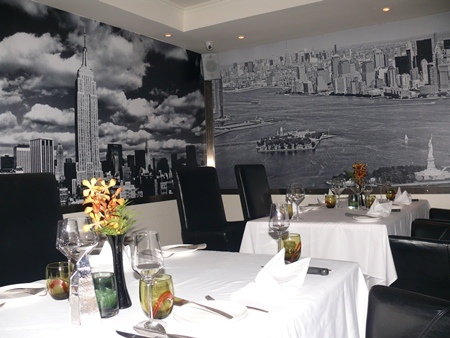 Home Lifestyle Dining Out Manhattans – reborn! The Manhattans Restaurant and Bar at the top of Thappraya hill in the ground floor of Nirvana Place has had a troubled childhood. At times it was obvious that it had lost its way and then some ownership changes threw the whole concept topsy-turvy. However, the Dining Out team is pleased to report that Manhattans has finally found its true direction under the eye of GM Bart Munsters (and the watchful gaze of a couple of reef sharks in the aquaria). 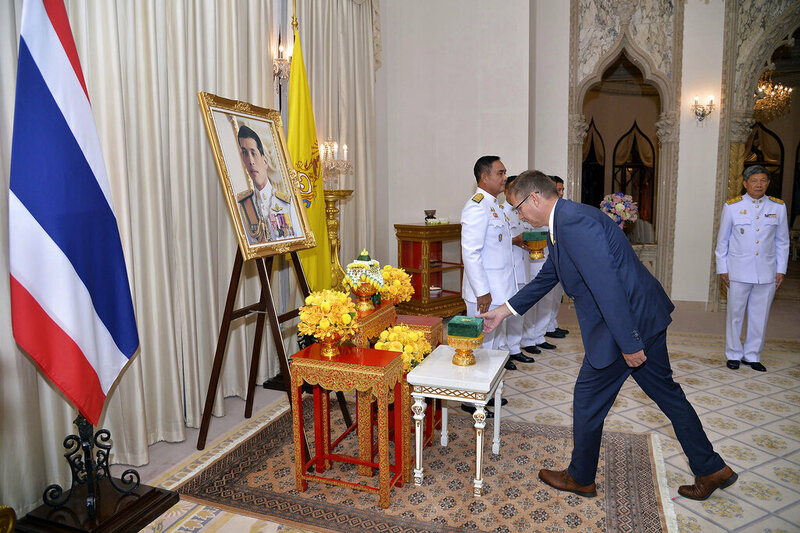 For the purpose of this exercise, I took a visitor to Thailand as part of the team. Someone with no pre-conceived notions as to what the restaurant was, so you can look upon this review as if Manhattans had just opened. The venue itself is stunning. The cocktail area is all chrome and glass and is bright and modern. Two very large aquaria separate the cocktail area from the plush and very elegant dining section, complete with black leather arm chairs and large white linen topped tables. Outside is a new al fresco dining area for a more relaxed atmosphere if that is your fancy. For us, it was the whole fine dining experience, so we began in the cocktail area with a couple of Australian chardonnays to cleanse the palate. Before going into the dining area, we also had the opportunity to chat with Bart Munsters, the jovial young Dutch chef and GM. Much of his professional life has been spent in fine dining restaurants in up-market cruise ships, as well as being a TV chef. He is a well-built young chap, and as they say, “Never trust a skinny chef.” You can trust Bart! On settling in to the dining area we were presented with the menu – surprise, surprise! This is no ordinary menu, but we were all given a Samsung Galaxy to flip our way through. For those used to this android technology it was no problem, but for Miss Terry Diner, stuck in the 70’s technology, there was a little hesitancy at first. But our helpful service chap soon had me flicking with the best of them. The menu is not large, but has been carefully selected to be able to be called European fine dining. Several types of oysters ranging from Fin de Claire, Irish and more, leaving the diner with mouthwatering choices – I succumbed and ordered half a dozen Fin de Claire (my favorite). There are also Dutch black mussels that are brought in at weekends. Bart is very proud of his steaks which are imported from Australia, plus Canadian Black Angus and Wagyu. These range in price between B. 800 through to B. 2,000 for a Chateaubriand for two. In the soups were a pumpkin, a lobster bisque and my choice of a French onion (B. 250). 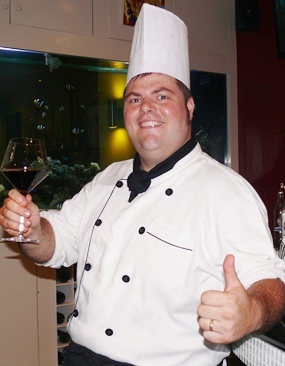 Bart Munsters, the jovial young Dutch chef and GM. The android menu is also accessed for the wine list and there are plenty of choices between B. 1,000-2,000. We selected the Stonefish Margaret River Shiraz 2008, excellent drinking at B. 1,450. I also noted Hugo Casanova wines were stocked, again at similar prices. Thai dishes are generally around B. 200. We each had different main courses. Our visitor had decided on the pork tenderloin (B. 560) and was very satisfied. The resident had chosen the lamb which was presented as three meaty lamb chops (B. 885) and again scored top marks, while my chicken stuffed with parma ham (B. 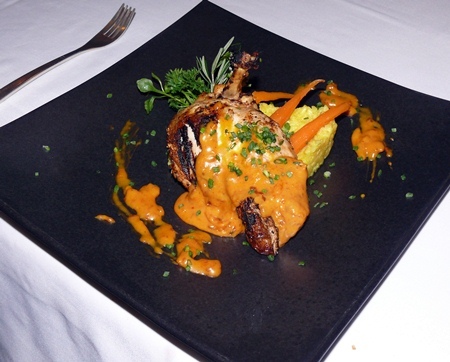 510) on risotto was the best chicken dish I have ever had. Moist and flavorsome, delightful! I can only describe the evening at Manhattans as being exceptional. More than adequate portions, very well presented and cooked with European flair. The venue, the ambience, the service and the food makes for an excellent total package at the top end of fine dining restaurants in Pattaya. Highly recommended. Manhattans Restaurant and Bar, Nirvana Place, 482/1-4, M12, Thappraya Road Pattaya. 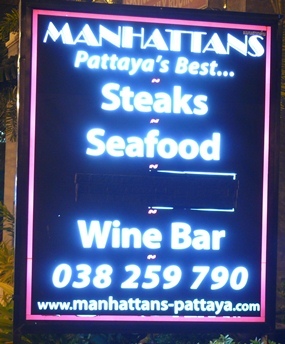 Telephone 038 259 790, www.manhattans-pattaya.com. Open 5 p.m. until very late (but last orders for the kitchen 10.30 p.m.). Adequate road-side parking. Live music Saturdays. Closed every Sunday.